Posted on Thu, Mar 8, 2012 : 3 p.m.
>> Milk stouts! Irish stouts! Russian imperial stouts! Try them all and more at Arbor Brewing’s stout tasting from 7-9 p.m. Tickets are $30 and include access to a scrumptious buffet and super cool raffle prizes. Call 734-213-1393 or buy at the door, if available. >> All aboard the bus to Detroit for some early St. Patrick’s Day fun. Lake Street Tavern, 127 E. Lake St., South Lyon, has chartered transportation to the St. Patrick’s parade and stops at the Gaelic League in Corktown and the Old Shillelagh downtown. Pickup is at Lake Street at 11:15 a.m., with the bus returning by 6 p.m. Tickets are $50 and include beer (and a bathroom) on the bus, beads, sandwiches and a St. Patrick's T-shirt. >> Northern California comes to Ann Arbor at Ashley's, 338 S. State St., with a Lagunitas Brewing tap takeover beginning at 6 p.m. Brewery reps will be on hand to clink glasses and talk about the drafts pouring including Lagunitas IPA, Imperial Red Ale, Wilco Tango Foxtrot Strong Ale and the rarely kegged Doppleweizen and Imperial Stout, which is making its Michigan debut. >> Hit the road to Howell for another course in beer education at the Shark Club, 1140 S. Michigan Ave. Rex Halfpenny, editor and publisher of the quintessential Michigan Beer Guide, will cover IPAs, their hops, their history, and how they came to be one of America’s most popular beer styles. Tickets are $20 in advance ($25 at the door) and include the Wisdom of Rex, beer samples (Bell’s Two Hearted and Hopslam, Brewery Vivant Triomphe, Founders Double Trouble, and three others) and light refreshments. Unfortunately, you won’t get college credit for attending, but if it were up to me, you would. >> Who says beer is just for breakfast? Not the fine folks at Wolverine State Brewing, 2019 W. Stadium, who at 5 p.m. are offering our favorite beverage for dessert. Or, anyway, paired with a selection of tasty desserts including cheesecake, cupcakes, cookies, brownies and more. See wolverinebeer.com for the full menu. >> Head to the Corner Brewery, 720 Norris St., Ypsilanti, for another ratastic evening of Rat Pad releases from January’s Rat Fest. Beginning at 6 p.m., beers from Monroe’s Muskrat Mashers Homebrew Club will be tapped. Their brews included Belgian Wit, Chocolate Stout, DIPA, and the runner-up Best of Show beer, Citra Amber Ale. Growler fills available at 9 p.m., if there’s anything left by then. >> Lake Street Tavern’s latest beer dinner features the brews of Detroit’s own Atwater Brewery. As of this writing, full details including menu, time, and pricing are unavailable, but I can tell you the featured beers: Dirty Blonde, Purple Gang Pilsner, Grand Circus IPA, Cherry Porter, Decadent Black Chocolate Stout. Call 248-446-8898 for more information and to reserve. I've just been informed the Atwater Brewery beer dinner at Lake Street Tavern has been postponed to April 11. Mark your calendar! Bottles of Baudelaire iO Saison are back at Jolly Pumpkin Cafe & Brewery, 311 S. Main St. iO is a 6.8 percent alcohol-by-volume (ABV) elixir of deliciousness brewed with rose hips, rose petals and hibiscus and well worth your time and tastebuds. It's beginning to get a little Irish around town in anticipation of a certain beer-drinking holiday. One sure sign St. Patrick's Day is coming up fast is the return of Grizzly Peak's Amarillo Shamrock, a 4.6 percent "session ale" of dark ruby color and caramel, toasty, and citrus notes. 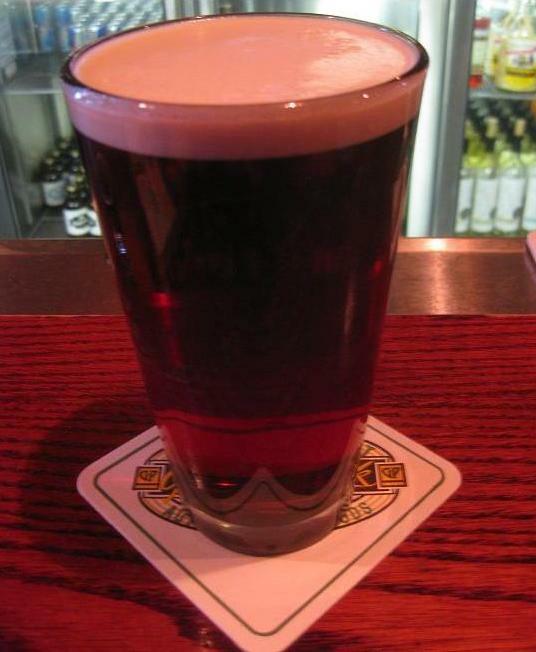 Poured from the nitro tap, it's the perfect ale to warm up your drinking muscles for the main event on March 17!